Really enjoying these ships and the settings you create for them. Great work! Hi Jamie, busy busy. I am curious as to why you left the AA batteries in place ? Where are the AA batteries, David? If you mean the round things at the top of the main body in the centre of the ship, they are part of the castings for the topmost deck and I can't get rid of them. The kit came with a stack of different guns (surprising number) but I haven't attached any guns. Ozmac wrote: Where are the AA batteries, David? I can't imagine the patience it takes to complete one of these, I have had a pre painted 1:43 GT40 model for years that I have not put together. You can be very proud of your work . Naaaaaahhhh. My starting motivation was that I didn't like the deadly dull all-grey colour scheme of the WWII ship, so I went looking for something more colourful. So I thought something civilian-ish would be more my style. As for grinding off bits, I am sure I would comprehensively bugger things up at some stage of that process, so I didn't even go there. So my model-building philosophy is something like: choose not your average subject matter, then add colour, imagination and a dash of cavalier disregard for accuracy! 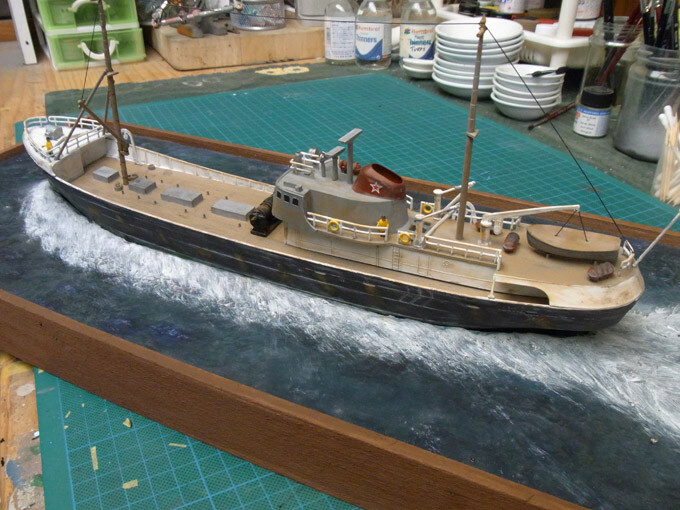 Still haven't finished the Liberty Ship debacle, as I've been distracted by my first attempt at weathering a model. I want to learn the skills, as I have a 1:43 car diorama in mind which involves first building the model, then weathering it, then doing the dio. 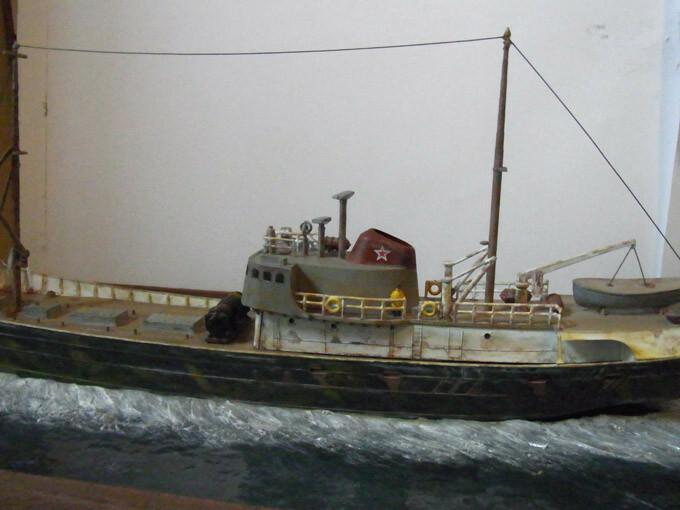 And so, for my first attempt at weathering anything, I chose the dirtiest, filthiest ship on the seas, the Soviet Spy trawler which I built a while back, but always intended to modify with a thick coat of grunge! There's all sorts of muck you can hurl at models to make them look soiled, and for this fishing trawler I used two weathering agents: finely powdered artist's soft pastel chalk sticks, mixed with rubbing alcohol (applied with a paintbrush); plus special "weathering master" kits made by Tamiya, which are basically like a lady's eye-shadow kit, except the colours are stuff like "soot", "rust", "red rust", "clay" etc etc. These are applied with ladies' mascara applicators, little foam pads at the end of short sticks. The good thing about practising on a dirty, filthy trawler is that if you stuff anything up, just add another layer of grunge. It'll be a lot harder adding fine streaks of oil out of the back of the engines an otherwise pristine aircraft. My next self-guided tutorial will probably be to add some wear and tear to an aeroplane model that I've already built. I'm sure that getting the hang of weathering will end up adding a lot of character to anything I build in the future, including little model cars in 1/43 scale. The ship looks amazing. 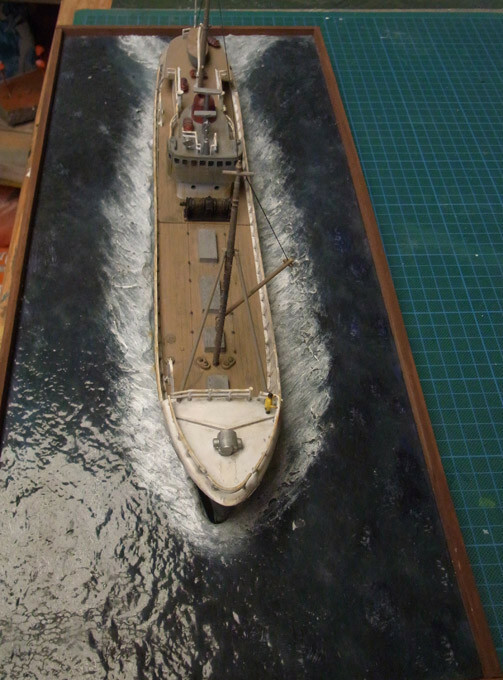 The water looks so natural and the weathering of the ship makes it very realistic. You must be proud. The entire package is very convincing, a job well done. Thanks Johan and Jeff. I think it still needs some work (ie, more grunge) but this "weathering" area does add a lot more character to some models. I do like many models to be pristine and shiny (especially my Art Deco diecast cars! 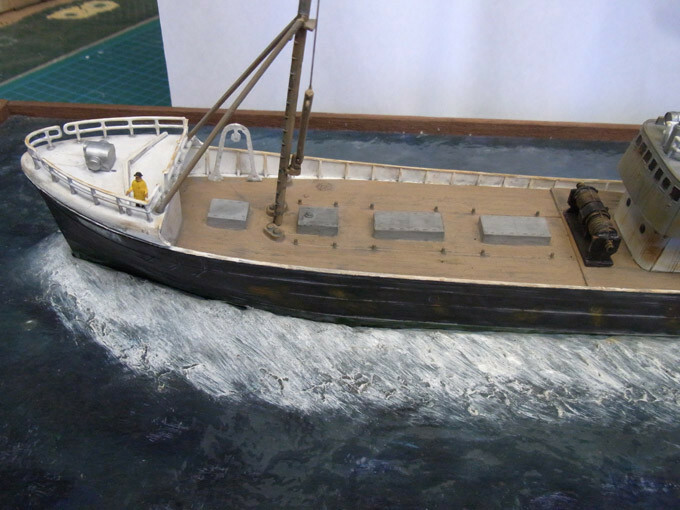 ), but hard-working, working-class ships, planes and cars really benefit from weathering. As I have already learned, it's a whole artform in itself, and I am, as usual, a mere beginner. Weathering works great here, it looks a lot more convincing now! When I did the same to cars, I used to collect pictures of real rust and damage as examples. When I did the same to cars, I used to collect pictures of real rust and damage as examples. I had two tips to offer, but I'm too late. 1) I found ladies eye shadow to be excellent for weathering. 2) As Tom suggested, it can be very instructive to examine pictures of real grunge on real ships. I imagine you might find some weathering tips in model railroading magazines and Websites. Model railroads always look worn, dirty, oily and rusted. Inspiring! Keep up the good work! When the internet didn't come to the rescue, I just went to my local garage and photographed a couple of the rusting hulks outside behind the building. In the case of boats I'd probably visit a nearby harbour, could be harder depending on your location though. Well, at least I have Sydney Harbour here, Tom, one of the world's great harbours. It will be good fun getting down around the harbourside area with a camera anyway! 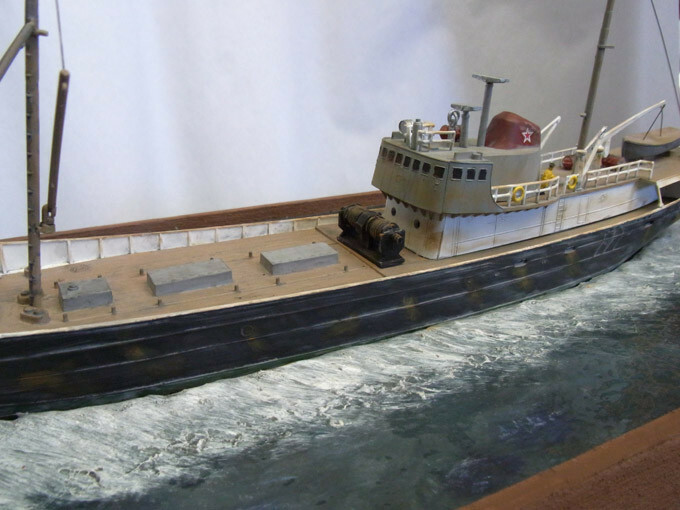 Well, all the shipbuilding experts on some of the plastic-model building forums agreed: not enough grunge, Jamie! 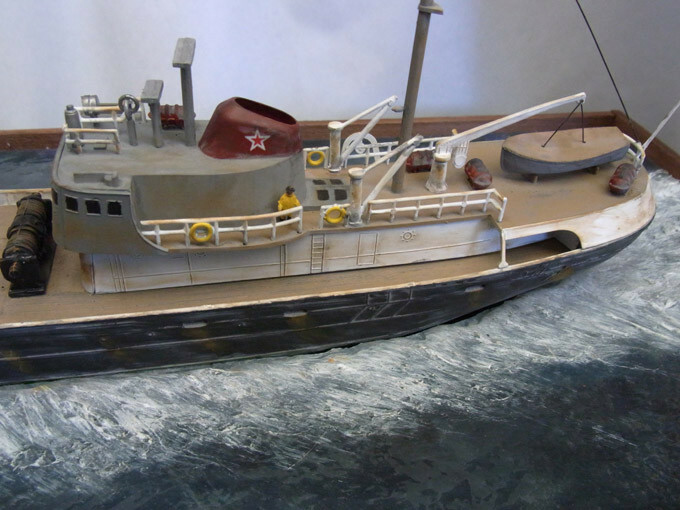 What I love about some of the commenters on those shipbuilding forums is the guys who say "I served months in the US Navy in the Gulf of Tonkin back in 'Nam being followed by these Russian spy trawler things, and they were filthy. Add more grunge!" Yessir! I can smell the dead fish from here. 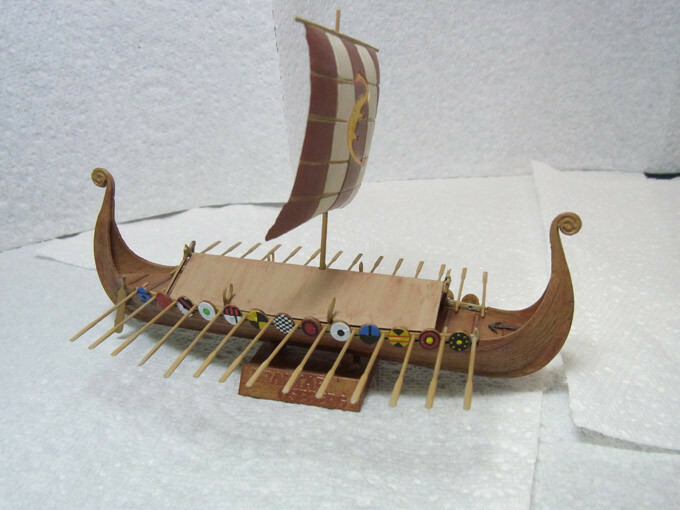 If anyone ever tries to say "What Scale143.com lacks is a Viking ship" you can tell them "hold on, not so fast buddy. We've got one of those." Here it is, in 1/180 scale, the 'Drakkar Oseberg', which is going to be part of my wife's birthday present a week or two from now. The kit is made by "Smer" who are from somewhere in Eastern Europe. It's a very basic kit but good fun nevertheless. 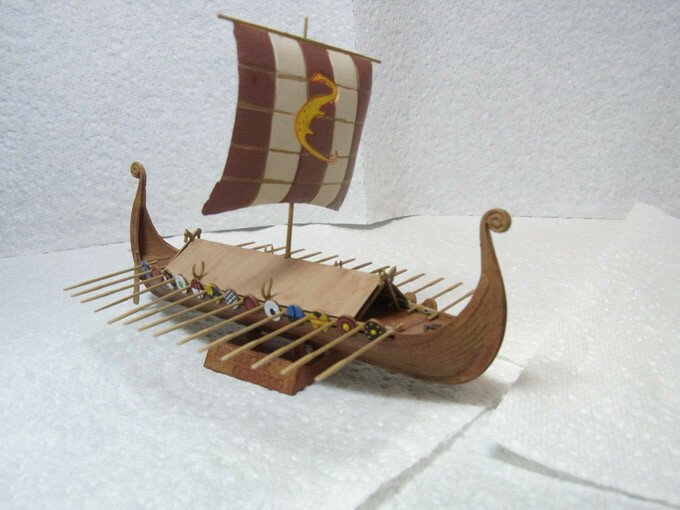 The finished ship is 15cm long and 10cm high, so it's quite tiny. The reason it is headed in my wife Pam's direction is that she's addicted to the "Vikings" TV series, starring Travis Fimmel, who she has a serious crush on. The girls in the show ain't too bad, either. 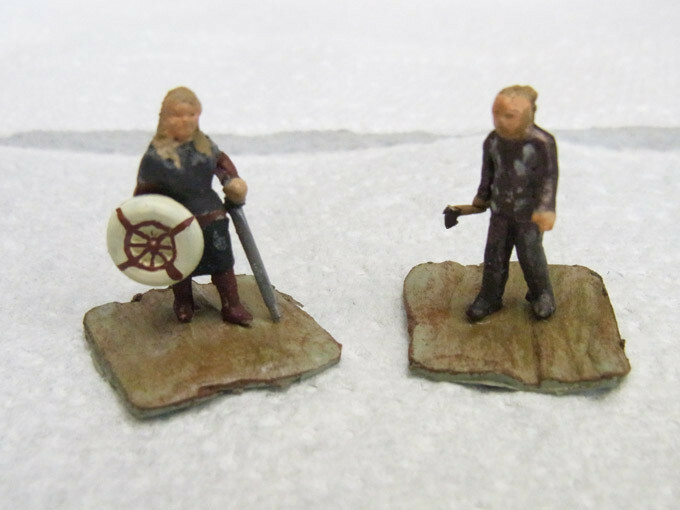 Though they're not part of the kit, I have made up two little 15mm high Viking people to go with the ship. That's Ragnar Lodbruk (Travis Fimmel) on the right. He's the hero, the King and, says Pam, easy on the eye. I don't my model quite captures that facet of him, though. And that's his former wife, Queen Lagertha, Warrior Queen who no man in his right mind ever messes with. These little people are in 1/150 scale, and they immediately look too big if you pop them on the deck of the 1/180 scale ship. So they are standing on shore, where the difference in scale is nowhere near so obvious.